Chios is the fifth largest Greek island. Its total area is 842 Km2. 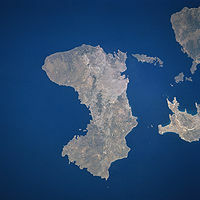 It is in the northeast of Aegean Sea, near Asia Minor coast. The biggest town of the island is Chios city. 51,936 people lived there according to the 2001 Greek census.